This is the BoatUS Foundation’s biggest fund raising event of the year! Celebrate the season by sending cards that show your support. All New for 2018! 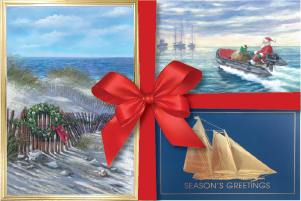 Introducing exclusive card designs from our new greeting card provider, Salt Harbor Studio. Check out these unique seasonal nautical designs that can’t be found in any store. All cards are crafted on high quality paper, some of which have distinctive metallic borders and embossing. Regardless of which design you choose, these cards are sure to show your friends how much you care about the boating lifestyle. And best of all, BoatU.S. Foundation for Boating Safety & Clean Water receives a portion of each purchase.